Running causes aches and pains ranging from minor to severe. Much of the pain comes from pushing yourself further than what's comfortable for you, which often results in sore muscles, joint discomfort, shin splints and side aches. These discomforts usually cause runners to slow down or cut the workout short. Learning to push through the normal pain associated with running allows you to build stamina and increase your running ability. 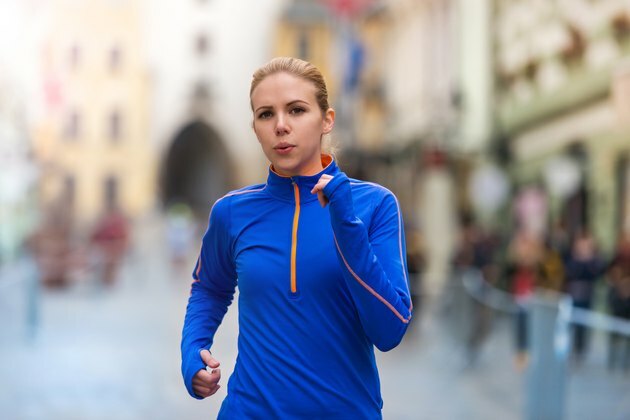 Prepare your body before the run to reduce or prevent pain. Eat a healthy meal before you run, and hydrate your body to fuel your run. Do warm-up exercises to prepare your muscles for continued movement. Run with a partner. Choose a person who is a stronger runner than you so she can encourage you to continue when you feel discomfort. Let your partner run slightly ahead of you to motivate you to keep pushing forward. Your running partner can also help distract you so you don't focus on the pain as much. Map out your running route based on the distance you want to cover. This gives you a definite end point to focus on as you begin to feel pain. Use same route, and become familiar and comfortable with it. Completing the route just one time gives you the confidence to know you can push through the pain and do it again. Focus on your breathing. Draw in deep breaths and exhale to ensure your body gets enough oxygen. Focusing on your breath also distracts you from other pains or aches you might feel. Think about a funny movie, an upcoming event or a work situation. Focusing on something other than the pain and running helps you keep going even when you feel uncomfortable because your mind is distracted. Set small running goals as you run to keep yourself going. Tell yourself you'll run to the next intersection, then change it to the next curve in the road. This makes the run seem more manageable even though you're feeling pain. Visualize yourself completing your run, whether you're training or competing in a race. Focus on the end result so you can push through the pain to get there. Keep a mantra running through your head that helps you deal with the pain. Say the mantra aloud if you need the extra push to work through the discomfort. Stop running immediately if you feel a sudden, severe pain in your body, which may indicate an injury. Pushing yourself through the pain of an injury may result in more severe damage. Ice the painful area, and contact a physician if the pain does not subside or worsens. Choose a running shoe that's flexible and provides superior cushioning to keep your feet comfortable during long runs. Do not attempt to push through chest pain. Instead, stop running immediately, and consult your physician.